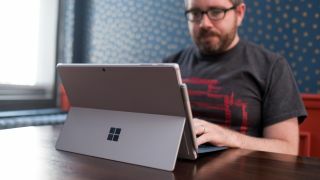 An online retailer has accidentally spilled the beans on the existence of a new version of Microsoft’s Surface Pro tablet with LTE connectivity before it has been officially announced. While there have been rumors that Microsoft was going to announce an updated Surface Pro with LTE, possibly at an event in October, it seems the UK store Misco has jumped the gun by accidentally posting a page allowing customers to pre-order the new Surface Pro with built-in cellular connectivity. Microsoft shouldn’t be too crestfallen that its new Surface Pro has been leaked, though, as the company itself has previously alluded to the existence of a version that can connect to mobile networks as well as Wi-Fi. Still, let’s hope Microsoft has a few more surprises for us at its upcoming event. According to a screenshot of Misco’s Surface Pro LTE pre-order page, which SlashGear has posted, there will be two versions available. The first one comes with a 7th-generation Intel Core i5 processor, 4GB of RAM, 128GB SSD, a 12.3-inch display and of course LTE connectivity. This version will apparently cost £1,132 (around $1,400, AU$1,800) . The second one has the same core specifications, but boosts the RAM to 8GB and the SSD to 256GB. This variant will cost £1,402 (around $1,800, AU$2,300). The pre-order pages have now been taken down, and those prices may not be final, so we’ll wait for an official announcement from Microsoft before getting too excited about the existence of the Surface Pro LTE. As we mentioned earlier, if it does exist, we’ll likely hear about the new variant of the hybrid at Microsoft’s October 31 event in London.